Semtech Corporation - is a leading supplier of high performance analog and mixed-signal semiconductors and advanced algorithms for high-end consumer, enterprise computing, communications, and industrial equipment. Products are designed to benefit the engineering community as well as the global community. The Company is dedicated to reducing the impact it, and its products, have on the environment. Internal green programs seek to reduce waste through material and manufacturing control, use of green technology and designing for resource reduction. Publicly traded since 1967, Semtech is listed on the Nasdaq Global Select Market under the symbol SMTC. The challenges that Lineable sets itself: protecting the health and life of the family and preventing potential problems with intelligent solutions. Using a combination of the most common and most advanced technologies such as Bluetooth, GPS and LPWAN. To use the service / product from Lineable, it’s more than enough just to download the application and save a small portion of the battery of your smartphone. Lineable One - this product line, designed to protect children aged 3 to 7 years. It allows parents and guardians to track the location of children, their health and activity history using the Lineable App. Lineable One uses LoRaWAN technology, which is very efficient and effective for location tracking. This is a smart wearable device that locates your child in case of emergency. Lineable Silver is a smart wearable device designed to protect and empower older people who are constantly involved in daily activities. In Lineable Silver, there are special features that help carers and family members monitor user health and respond to emergencies using the Lineable App. Lineable Silver is highly recommended for older people with Alzheimer's and Dementia (mental impairment). The LoRaWAN network provides reliable communication over long distances (up to 40 km in rural areas and up to 3 km in urban environments, depending on the characteristics of the gateways) between sensors in the field and radio stations. LoRaWAN was designed to specifically reduce power consumption and extend the battery life of connected sensors up to 10+ years, minimizing the cost of replacing the battery. Lineable is currently invested by the owner and the only chip provider of LoRa technology, Semtech. The Lineable Silver device, jointly developed by the National Police Agency of Korea, SK Telecom and SK Hynix, specifically for Alzheimer's patients. Through a hybrid GPS system, allows caretakers to be notified when patients leave home or leave a designated safe zone. Many patients are not constantly monitored by caregivers, and in Korea, about 10,000 Alzheimer's patients disappear annually. Lineable Silver is currently used by police in Korea, and the police plan to distribute 3000 devices per year to Alzheimer's patients for free. During the first month of service in October 2017, the Silver device helped save six patients, and in three months another 20 patients. For more details on how to use and the characteristics of various devices, see this link. Semtech’s LoRa devices and wireless radio frequency technology is a widely adopted long-range, low-power solution for IoT that gives telecom companies, IoT application makers and system integrators the feature set necessary to deploy low-cost, interoperable IoT networks, gateways, sensors, module products, and IoT services worldwide. IoT networks based on the LoRaWAN™ specification have been deployed in over 45 countries and Semtech is a founding member of the LoRa Alliance™, the fastest growing IoT Alliance for Low Power Wide Area Network applications. The first approach would be appropriate for individuals without cell phones or areas where there is not reliable cell service. The method of gathering the data is similar to traditional cloud approach — the real difference is once the data is on the blockchain. Once the data (or the transaction hash) is stored on the blockchain, anyone in the network can verify / prove that the data came from a specific device. This makes the data “pure” in the sense that others can verify that it is original and nobody has tampered with it. Also, once data is on the IoTeX blockchain, it can be sent completely privately using IoTeX’s privacy-preserving techniques. Provide trusted data for research: Lineable’s ultimate goal is to provide data to research institutions to pre-diagnose medical conditions (e.g., dementia, Alzheimer’s). Research institutions can independently verify the original source of the data to ensure they are working with untampered data. Create a data marketplace: Personal health data is extremely valuable to insurers, personalized healthcare providers, and other medical corporations. Lineable users can choose whether to sell their data to these entities, and profits can be used to fund research or lower costs for users, as described below. Incentivize use of devices: Complete, continuous data sets are more valuable than fragmented ones. As a result, data buyers (e.g., insurers) can incentivize Lineable users to keep their devices on and provide more complete data. This could eliminate costs to users, and even be profitable for users. 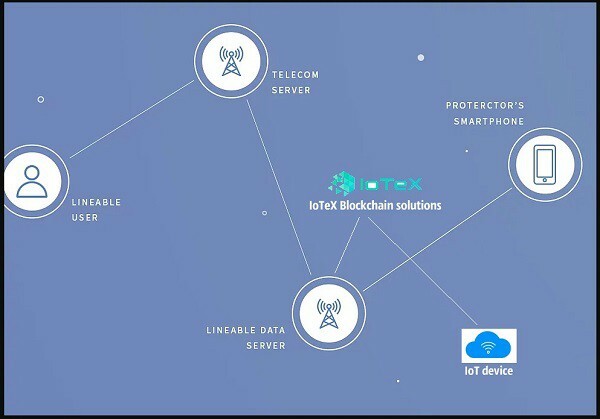 As more devices are connected to the IoTeX blockchain, Lineable devices will be able to interact directly with various types of devices. In an emergency situation, Lineable’s products currently offer an SOS alert that send a “help message” and location data to all protectors. With blockchain, the Lineable device will be able to broadcast this message to not only the user’s family members, but also nearby devices that can help the distressed user (e.g., point nearest video camera to user location, turn on nearest flood light, sound nearest alarm). Although it is too early to publicize concrete milestones and timelines, IoTeX and Lineable are both committed to one overarching goal: connect all of Lineable’s devices to the IoTeX blockchain in 2019. To achieve this goal, Lineable has staffed up their new blockchain team and are currently building the Lineable decentralized application (DApp). Similar to IoTeX, Lineable is a company that builds their hardware, software, and firmware completely in-house. This offers a major advantage for our partnership, as both partners are agile / versatile and deeply knowledgeable in our respective domains. We look forward to working with Lineable to ensure their DApp fully leverages the capabilities of IoTeX’s blockchain to make Lineable’s vision a reality.